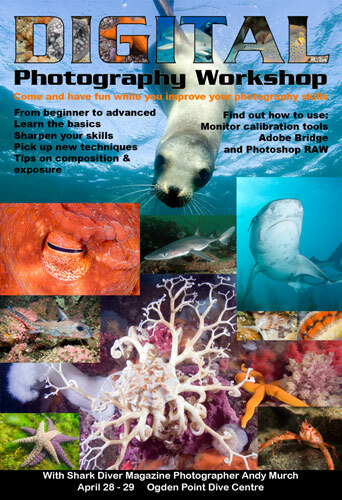 A smart but simple workshop for photographers that want to improve their underwater shooting skills and learn how to prepare their images for commercial submission. 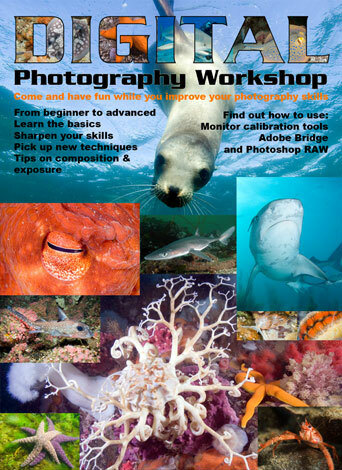 The Digital SLR Fundamentals Workshop is for anyone wishing to improve their skills. · Equipment options (lenses, ports, housings, etc). · Specific dive skills and considerations for underwater photography. · Techniques for improving macro photography including the use of extension tubes for super macro work. · Techniques for improving wide angle photography and working with models. These presentations involve extended Q & A sessions and often continue long into the evening. The second part of the workshop takes place in the water. Participants will have the chance to practice the skills that they have learned. Visibility permitting, the dives will concentrate on perfecting wide angle exposure and composing images with models. · Monitor Calibration – choosing a suitable environment and the use of calibration tools. · Adobe Bridge – learning correct workflow to prepare images for Photoshop. · Manipulating images using CS2/3 or other versions of Photoshop. · Preparing images for commercial submission. The course covers a great deal of ground and takes place over two full days. It is a lot of fun and highly rewarding for everyone involved. Participants should own (or have access to) a Digital SLR camera in a housing and at least one strobe. Good diving skills are an asset. Participants may also want to bring a laptop computer (with Photoshop installed) to the post dive presentations. Once you participate in the DSLR workshop you will be given access to all of the course material for review whenever you need it. Plus, you will become part of the mentorship program which means that if you have any follow up questions related to DSLR photography you can contact me indefinitely. If this sounds like the course you've been looking for, give me a call to find out when the next one is going to be held. Or, if you can't get to one of the scheduled workshops, suggest to your local dive shop that they host one. I can usually schedule a workshop at your local shop if I have a minimum of 6 participants.